1. The first step is to get to your engine bay. Start by retracting your top to about half way position. Lower both windows. Then from either side unclip the plastic rail by pushing downward (2 clips hold this) Reach down from the side and feel a small cable attached to a ball socket, undo this cable by pulling outward (bottom end only) ( both sides) Now you can fold the back of the top forward to an almost upright position. on the drivers side of the bottom surface of the top should be a strap held on by a piece of Velcro. take this strap and hook it to the front inside of the top. Now you may close your top 3/4 of the way and turn off your key and remove. If your top no longer has the strap, you can use a bungee cord to hold it forward. 2 now we will put the top cover into the service position. Unclip from either side the lock clips holding the rail. pull the rail inward until it is release from the pin., Now you can lift it towards the top and put a pin of bolt in the holes on either side as noted in the picture. 3. 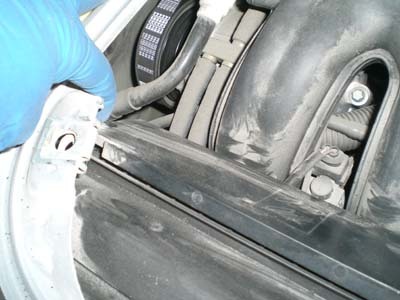 Remove either the speaker or the storage compartment as follows. If you have the Bose speaker then unplug the wire from the passenger side by squeezing the plug together and pull. 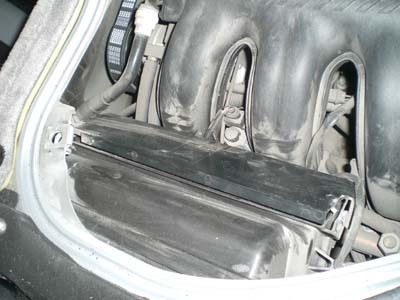 Give the 2 plastic retainers on top a quarter turn and lift it out being careful not to drop it on your trunk. Then release the other 2 retainer holding the carpet down and remove the carpet. Now we are down to the actual engine cover which has 5 Zeus type fasteners holding it on. Loosen all the fasteners and if some hang up ( which they usually do) just wiggle the cover back on forth and lift at the same time. 4. At last we have found the top of the engine. 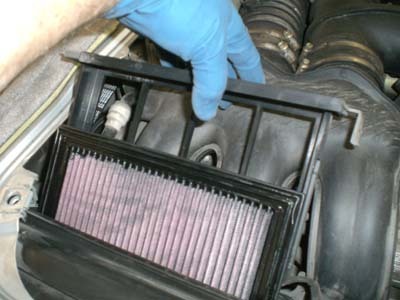 (most likely very dusty) Here you can check your power steering fluid and your air filter as well as having access to the MAF sensor among lots of other items we will discuss on other occasions. 5. 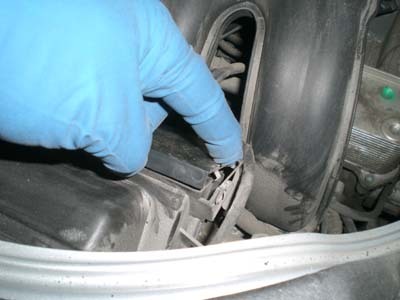 Now to remove the air filter which is located to the drivers side of the engine bay. 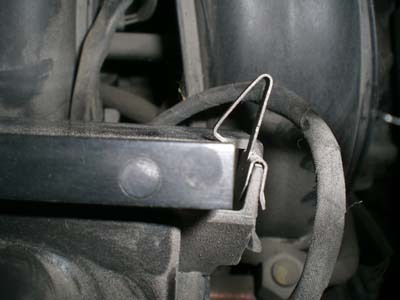 It is held in place by 2 metal spring clips push the both to the outside and pull on the air filter holder. You might have to wiggle it and pull hard. sometimes they hang up. once you have it out replace it with a new one as per our recommendation. 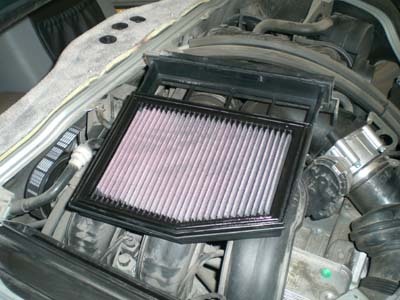 If you decide to use a K&N filter (recommended) be careful to let the filter oil drain overnight before installing it. When it's time to clean it be sure to use the K&N cleaner and lightly spray on the K&N oil - again let it drain overnight. 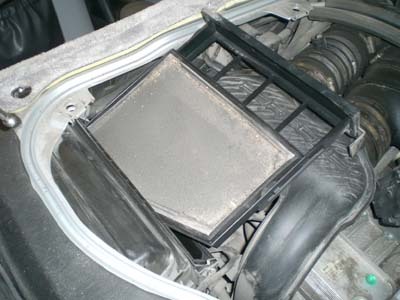 This will prevent the MAF sensor from becoming contaminated. 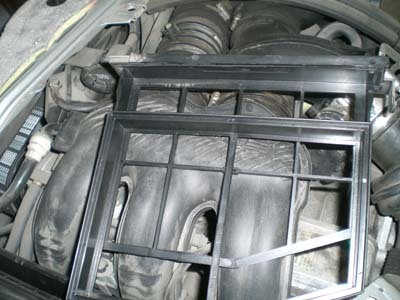 We have used these extensively in our own cars and customer cars over the years without any problems with the MAF senor. 6. Finally when reinstalling make sure the metal clips snap in place completely. If using the K&N filter you will have to push a little harder as the fit is much tighter. Then reassemble in reverse order make sure to snap the top cables on the ball socket completely and if you have the Bose speaker be sure to plug the speaker wire back together.